Craft Stamping Quartet: And We're Off! Long time, no see on this poor neglected little blog! First of all many thanks to anyone who drops by to see the first project post in a blooming long time but there you go, life gets in the way sometimes doesn't it. 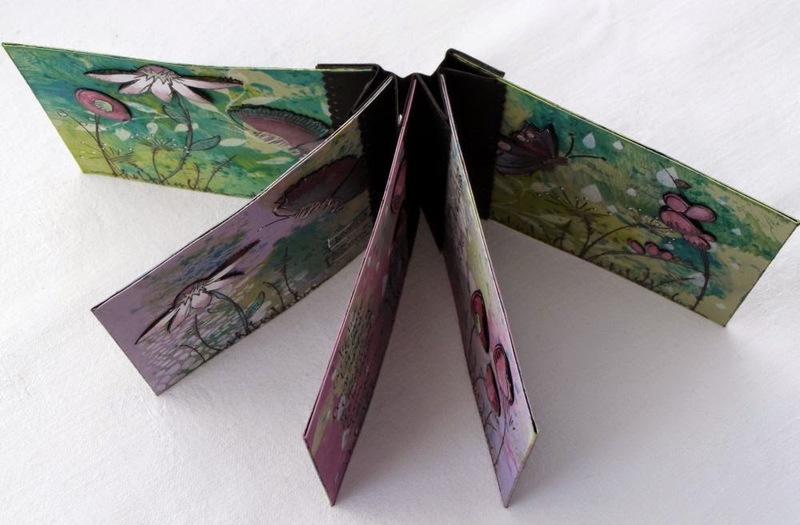 Elaine liked a little book of Kate Crane's which you can see here and suggested it as inspiration for our return round of projects so today I have my version to show you. Now confession time! I started this several months ago and made some very basic mistakes and almost binned it but I kept it on one side and decided to have a faff last week to see if I could make it presentable. Having learned from my mistakes I could do a much better job on another one but thought it only fair to show my gaffs, lol! Unfortunately, I forgot to take step by step photos and because most of it was done a while ago I have almost forgotten what I did but I'll tell you what I can remember. First of all I created a concertina 'spine' from black card. I chose to have 3 pages plus front & back covers so needed a total of 5 valley folds. I then cut 5 pieces of black card 4" x 8". I decided to colour my backgrounds with PaperArtsy Fresco Finish paints so I put puddles of paint on my craft mat one colour at a time, spritzed quite liberally with water and then dragged my pieces of card through. I dried with my heat gun between each colour and kept adding colour until I had an effect I liked and good coverage. I then used various stencils and Fresco Finish Snowflake paint to create the next layer. 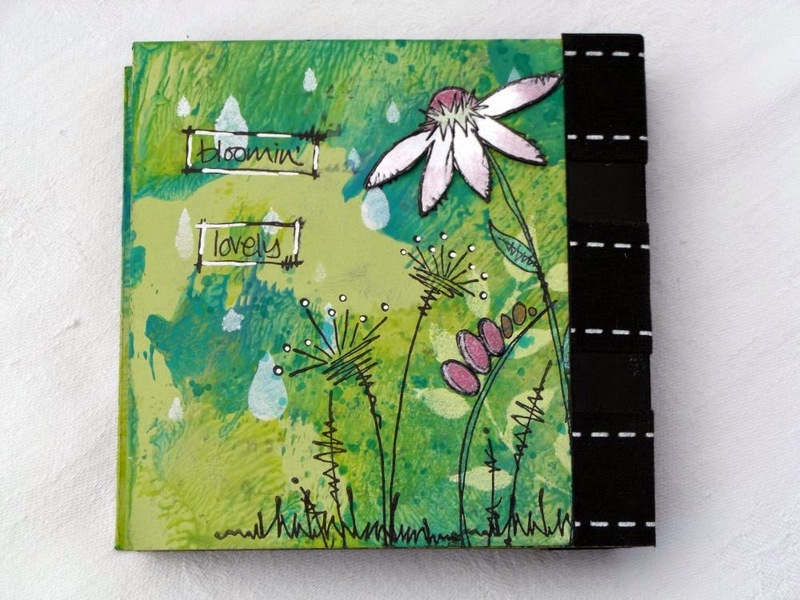 Next, I used a selection of PaperArtsy's JoFYstamps to stamp on each page with black Archival Ink. I also stamped the flower heads onto white card and heat embossed with clear EP before dragging out my much neglected Twinkling H2Os to colour them with. 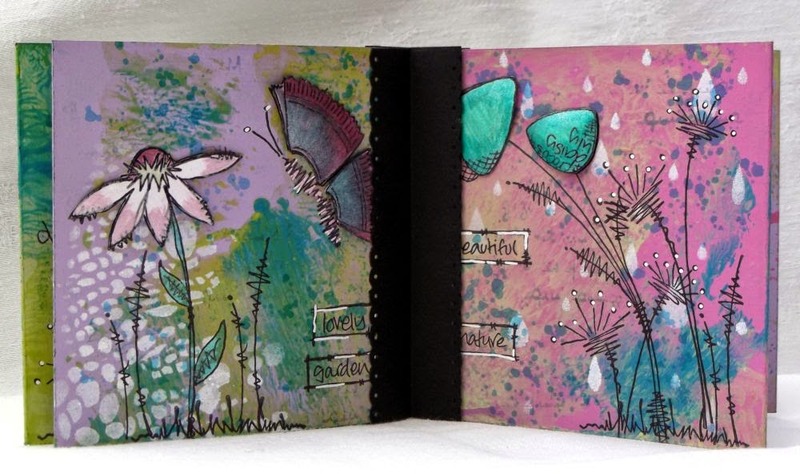 I also added some of this colour to the stamping on the pages. I folded each of my pages in half and stuck the blank sides together with double sided tape so that I had five 4" x 4" pages. 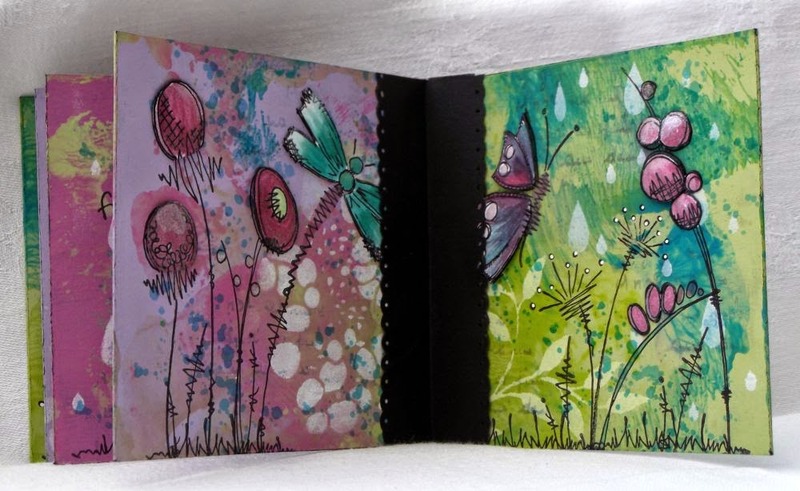 I cut out the separate flower heads and decoupaged them onto the pages with dimensional glue. I also decided to add a few highlights with a white Posca Pen. Then came the assembly ...... and this was where I realised my mistake! It's glaringly obvious now, lol, but have you guessed it yet? I had forgotten to allow for sticking the pages to the concertina and had stamped over the whole page and even some of the raised elements and wording ended up being slightly covered by the black 'mountain' folds. Never mind, we learn by our mistakes and I don't think I'll make that one again ;D.
I cut some strips of fairly thin black paper and used a border punch to decorate the edges before folding them in half and sticking them over each concertina fold to give a more finished appearance. Finally I used some 7Gypsies sticky backed fabric tape to hold the spine together. In the end my little book didn't turn out too badly I don't think. The part I was most pleased with was the paint & stencil layers in the background. Well, that's the end of my post for today. I have no idea which of my lovely buddies will finish their project next or exactly when but as we all have different commitments now our posts will be as and when we can fit them in. I do hope you'll keep an eye open for when they pop up and let us know you dropped in by leaving a comment if you have time. 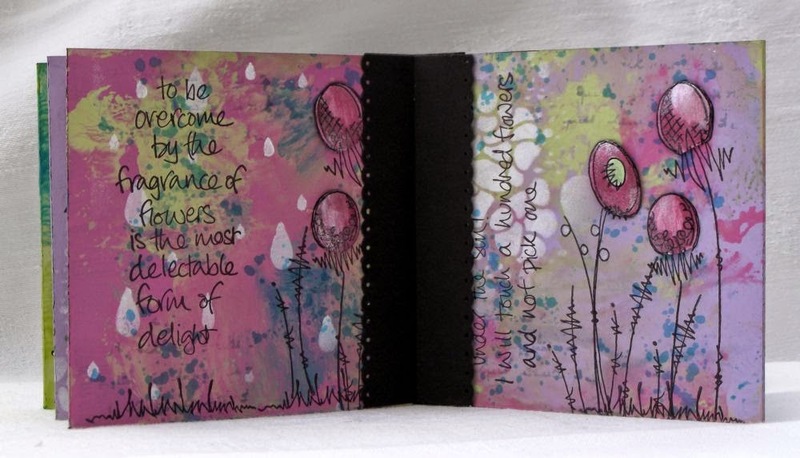 oh, despite your "omission" it looks fabulous, and I love the stamping on your painted pages. Good to see you back, will watch out for more! Stunning project...the colours are a perfect combination. Hi! Great little book :o) but I have to confess that mistake (not allowing a margin for sticking down) is one that I know I would make - even now you've pointed it out!! The JOFY stamps work really well. Good to see the quartet back in action. This is a great project and it was helpful to hear about the pitfalls along the way! Great choice of stamps and colours. that's beautiful Lesley, your background have lots of depth and gorgeous colours. Wow, gorgeous Lesley, and I would have to look hard for the mistakes. I love the paints you've used (something else to add to my wishlist) and the way you made the backgrounds. Great to see you back on this blog. A gorgeous project Buddy, I saw this before it was completely finished, and it looked stunning then. The colours in IRL are absolutely amazing, especially with the twinkling H2Os. I like the bits of the pages in the spine, it's like stamping an image off the edge, gives it more of pop. You are a very talented crafter Lesley, what an amazing project for your return to your shared blog. I think it's gorgeous Lesley, each page is a beauty. Great to see a post on this blog again, looking forward to more. Nice to have you all back together again - it's a lovely start Lesley! Surprising how vibrant the colours are on a black card - be very interesting to see how the others treat this. Absolutely stunning, Lesley... 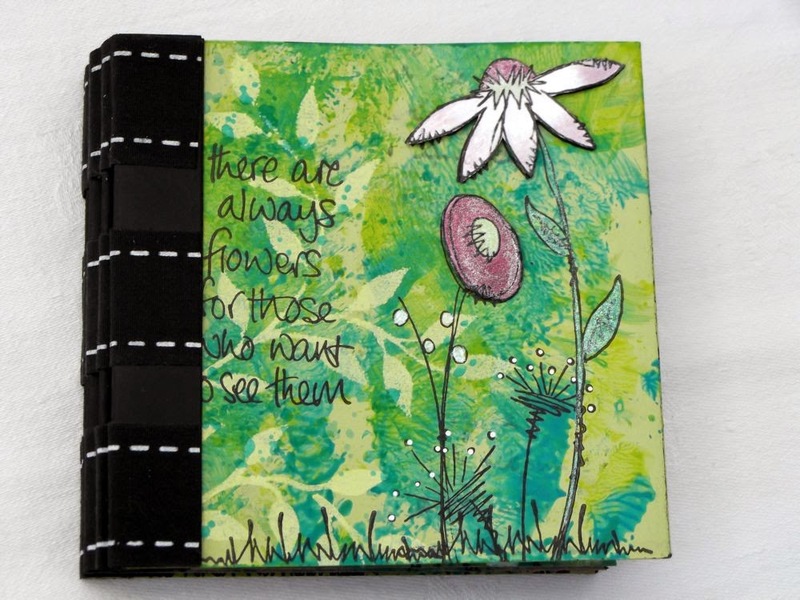 I rather like the bold black binding - it adds drama. 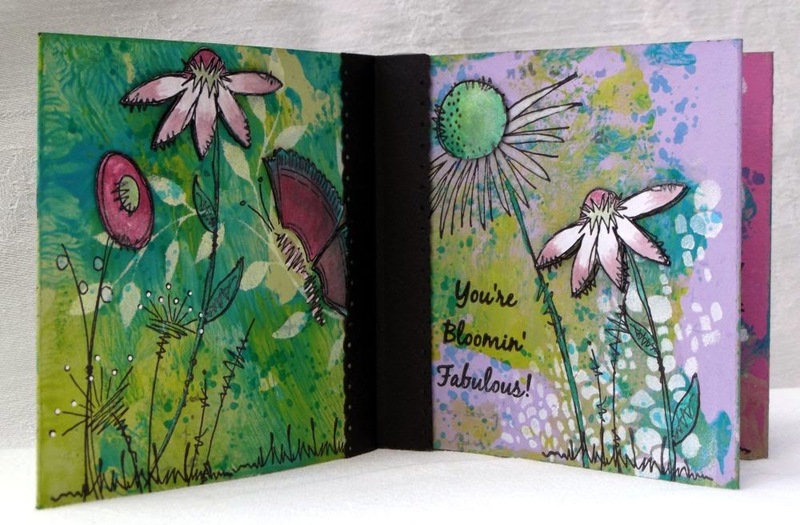 Every single inky background is delicious, and your brilliant colouring of the JOFY flowers really sings... I love this!